After you create a recital, you'll add performances. Each performance has a song associated with it, and one or more classes can be included as participants in the performance. Point to Events and select List Recital. Use the link (recital name) to open the Recital Editor. In the Recital Editor, click Add. In the Add Performance window, enter a Performance Name. Optionally, add the Song, Length, and Notes. Repeat Steps 3 - 5 until all performances have been added. The performance order can be altered / re-ordered by clicking on a performance and dragging and dropping it to the desired position. To delete a performance, highlight it and click Delete in the Recital Editor. 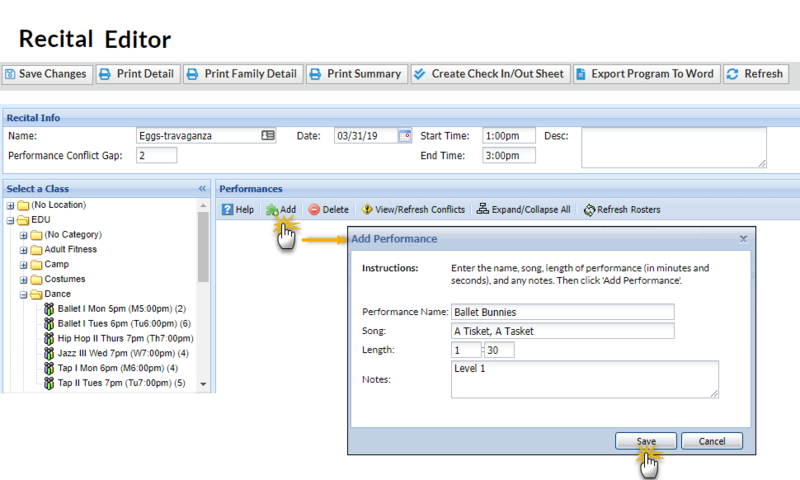 For solo performances, add the class to the performance and remove the check for all students except the soloist. Once you have added your performances to your recital, you are ready to add classes and students to them.